Tammy Mayrend recently did an overview of cider mills in Washtenaw County. It is a great survey of all of the ones our region has to offer. I can think of no better way to celebrate apple season than to visit the longest continually running cider mill in Michigan - and it is right down the road. 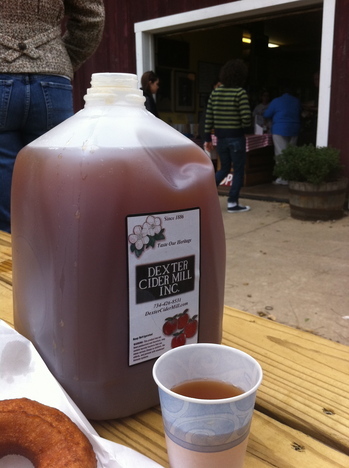 The Dexter Cider Mill began pressing apples in 1886. In 1986 Richard Koziski purchased the Mill from the second owner, who had owned it for 90 years. Recently, the Mill has been taken over by Richard’s youngest daughter, Nancy Steinhauer, and her family. “We love it,â€ shared Steinhauer. “Without my dad we wouldn’t be able to do it, and we have so much fun. We are so fortunate we can carry on the tradition.â€ If you visit the Dexter Cider Mill on the weekend you will see not just Koziski and Steinhauer, but also Steinhauer’s sister, husband and three boys working with the shiny fruit, following the same process that has been happening in that building for almost 125 years. Aside from the crushing area, all stages in the cider process are open to the public for viewing and education. The basement pressing area is cordoned off with a screen, behind which Koziski elucidates what is involved in their operation. 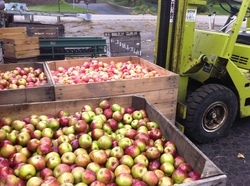 Last Saturday, the mill was pressing cider from four apple varietals: Macintosh, Gala, Yellow Delicious and Honeycrisp. Typically the cider is made from a blend of three or four different varietals, depending on the tartness and flavor of the season. Each day the flavor will differ depending on the blend and the ripeness of the fruit on the trees. The apples are checked for quality, divided into bushels and washed. The whole building shakes and moves in time with the machinery when the apples are crushed into mash. The mash is funneled via gravity onto racks in the basement where it is spread evenly and wrapped in strong cloth. When the mille-feuille of apple mash is eight racks high, it is pushed to the press. Where once steam moved a thrashing machine, electricity and a hydraulic press now compress the apples. The cider that comes off of the press is immediately refrigerated to 43 degrees, which preserves the freshness. Thirty-two bushels of apples, when pressed, produce about 100 gallons of apple cider. The apple cider is pumped up immediately to the holding tank where waiting jugs are placed under the foaming spigots. Patrons pulled the fresh gallons and jugs off the counter as fast as they were filled. With a heavy gallon of fresh cider in hand, you could add to your trip with fresh apples, apple butter, a copy of The Dexter Cider Mill Apple Cookbook, cider jelly, hot apple strudel or freshly made donuts. There are many benches to sit on, some right next to the river, while you enjoy your hot donuts and cool cider. On the weekends you can taste wines from Sandhill Crane Winery to round out your visit. The Dexter Cider Mill is open 9-5 Wednesday through Sunday during the season, which runs typically from late August to mid November.